A unique opportunity to test drive some of the latest sprayers from several leading manufacturers is once again set to be a popular draw at The CropTec Show. CropTec’s outdoor sprayer demonstration feature was rated as excellent by 80% of visitors last year. As well as being able to try machines out on a one-to-one basis, visitors will also have dedicated time with an expert, providing an excellent opportunity to compare and contrast some of the most up-to date sprayers on the market. Simply visit a manufacturer’s stand in the exhibition hall to arrange a time. In addition, growers will be able to get up close to a wide range of innovative novel machinery and equipment and gain an expert insight into their operation in the trade halls. Agrifac’s Condor 4 self-propelled sprayer includes some of the latest self-propelled sprayer technology. StrictSprayPlus incorporates single nozzle control with turn compensation using an electric shut off PWM spraying system to ensure every drop hits the right spot. The Condor 4 is also fitted with StrictHeightPlus, Agrifac’s own boom-levelling system keeping the desired height to offer an exceptional performance to an already superior boom construction. The Chafer Interceptor is claimed to bring new levels of efficiency and usability to the medium sized self-propelled market. A powerful 240hp Deutz engine coupled to the advanced Bosch Rexroth CVT transmission keeps fuel use low and ensures traction is maximised on individual wheels in all field conditions. The operator’s environment is spacious, and comfortable, designed for maximum productivity. The machine offers market leading stability thanks to its low centre of gravity. The Fendt Rogator 600 self-propelled sprayer machine offers perfect boom position and ground following and a low centre of gravity. It comes with 3800/5000/6000-litre tank capacity and 500-litre clean water and an induction hopper with OptiFlow control centre. 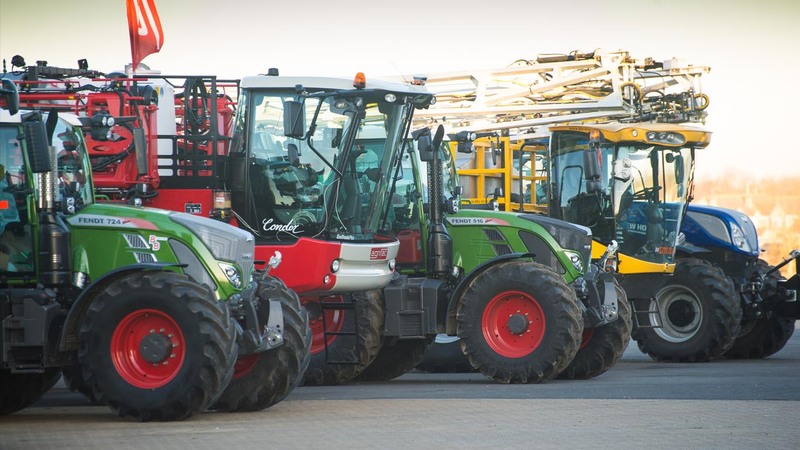 The machine is fitted with a HydroStar CVT gearbox in combination with engine wheel hubs, while the Fendt VisionCab provides all-round vision, automatic climate control and maximum legroom. Horsch Leeb’s 5 LT is part of the LT trailed-sprayer range (4 LT, 5 LT and 6 LT) featuring plastic tanks with 4, 5 and 6,000 litre capacities respectively. All feature BoomControl Pro, an advanced system designed to keep the boom as close to the crop as possible, less than 40cm at up to 30kph over hilly terrain. Three specification levels are available. Leeb LT boom widths range between 18m and 42m, with the new larger boom widths up to 42m also available for the Leeb GS. The ISOBUS operating concept is an in-house development and incorporates innovative functions that ease adjustment, operation and control of the machine. The optional steering axle uses its own gyroscope removing the need for cable or mechanical connection to the tractor. Lite Trac’s latest multi-purpose tool carrier, the LT350, is fitted with the Tier 4 Volvo 7.7 litre diesel engine, which provides 235kw (320hp) and high torque available at low RPM. Further upgrades have been made to the transmission using the Allison 3000 unit, while a higher ground clearance and a new cab operating system will improve driver comfort and ease of operation. The Lite Trac LT350 tool carrier can be supplied with a range of demount options including an 8,000-litre/36m sprayer. McConnel’s new high-performance self-propelled crop sprayer, the Agribuggy A280, is being introduced at CropTec. Light, compact, and highly manoeuvrable, it is said to deliver a greater power to weight ratio and better fuel economy than any of its rivals. Its unique low ground pressure design, just 8psi, enables operators to go where other sprayers can’t – working in wet conditions and tough terrain – allowing safe, productive working earlier and later in the year. Its positive mechanical drive and perfect weight distribution makes it one of the safest and most productive sprayers on the market. The new Vicon iXtrack T trailed sprayers are developed with focus on a short, low and compact design in combination with intelligent electronics and ease of use, with tank sizes of 2600 to 4600 litres. The 32-degree steering angle and 3.6m turning radius makes the iXtrack T very flexible and solid. The parallelogram combines optimal stability with soft boom balancing and limited vertical movement to minimise spray height deviations. The position of the tanks, hoses, valves and drains is optimised to minimise rest liquid.